The opening session of the closing day in the return of Slam Dunk to the Beach is in the books. 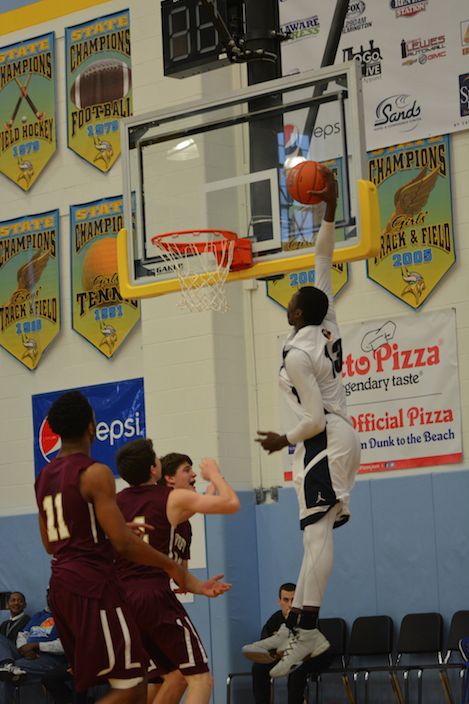 The daytime action on Monday began with Christ The King (NY) beating Sanford (DE), 65-55, then continued when nationally-ranked Our Savior New American (NY) edged The Haverford School (PA), 59-54, and wrapped up with Salesianum outlasting Caesar Rodney (DE) 67-52. Rawle Alkins turned in another stellar performance for Christ The King in the first game. The 35th-ranked player in the class of 2016 had 14 points in the second quarter alone, on his way to a game-high 23. He also added 16 rebounds, bringing his three-game total at Slam Dunk to the Beach to 37 boards. Alkins’ own coach obviously knew all of this before Christ The King arrived in Lewes, but he still cannot help but marvel at his star’s many gifts. Christ The King also got 10 points and five assists from Jose Alvardo, before the point guard departed with a leg injury in the third quarter. Jared Rivers added 12 points and three dimes for the 23rd-ranked Royals. Sanford, who trailed by as many as 22 in the second half, pulled to within 10 thanks to 17 points and eight rebounds from Mikey Dixon. Eric Ayala chipped in with 16 points and four steals for the Warriors. Game two was a back-and-forth affair throughout. The lead changed hands nine times over the first three periods, as The Haverford School battled its second consecutive nationally ranked foe. The Fords grabbed their largest lead of the game at 34-30, midway through the third quarter, but an injury to freshman phenom Cameron Reddish—at the 3:34 mark of that period–severely hampered Haverford’s cause. Prior to getting hurt, Reddish had poured in 11 points and had grabbed four rebounds. He returned in the fourth quarter, but could not add to either of those totals. Our Savior New American took immediate advantage, unloading an 11-2 spurt that put the Pioneers ahead to stay. Cheick Diallo, the No. 7 senior in the country according to ESPN, turned in a double-double with 13 points and 13 rebounds. Diallo, who has offers from Pittsburgh, Kansas, Kentucky and Iowa State among many others, added four blocks on the defensive end. Davon Dillard was the leading scorer for 17th-ranked Our Savior New American with 20 points. Damon Willson contributed 16 points and six assists to the cause. Haverford got 22 points and 10 rebounds from Lamar Stevens and 21 points from Shawn Alston. Stevens has offers from Villanova, Indiana and Temple, while Alston has already committed to Temple. In the nightcap, defending state champion Salesianum smothered Caesar Rodney with a 1-3-1 zone that kept the Riders off balance for much of the contest. Sallies held C.R. to just 16 percent shooting in the first half, on their way to a nine-point edge at intermission. The Riders shot the ball marginally better in the second half, even pulling as close as four points at one stage of the third quarter, but still managed to connect at just a 30 percent clip for the game. Donte DiVincenzo took over down the stretch. The Villanova commit scored 11 of his game-high 20 points in the final period. He added four steals, three assists and two blocked shots. Jaquan Hooks paced Caesar Rodney with 13 points and three dimes. Slam Dunk to the Beach wraps up on Monday with three games in the event’s sixth and final session.